While Christmas means festive celebrations and time spent with loved ones, for us, it means spending the holidays with the Faiers family. Join us as mum of two, Billie Faiers reveals everything from her favourite PJs from our nightwear collection, to super cute additions she loves to dress her little ones in this festive season. 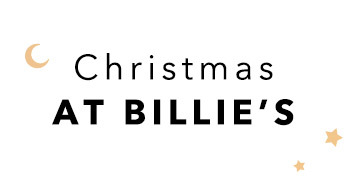 With family at the top of Billie’s wishlist, the mum of two can’t wait to spend time with her little ones this Christmas. Kitting everyone out in fun PJs featuring slogans and quirky designs, why not bring your family together with matching PJ sets everyone will love? Dressing the little ones in PJs is a Christmas Eve tradition in the Faiers’ household. Whether they’re cosying up with a Christmas movie or playing board games, ensure your little ones are set for the big day with our snug additions. Welcoming a new addition to the family? It seems like Christmas has come early! From colourful all-in-ones and sleepsuits designed with festive patterns, there’s so many ways to get little ones involved in the holidays. Being a full-time mum isn’t easy, but once all the festive fun is over and the kids have gone to bed, Billie loves to kick back and relax in a pair of cosy PJs herself. Sport our dreamy snowflake dressing gown as styled by Billie, or take a look at our wonderfully soft velour loungewear sets perfect for a little ‘me time’.